Born 15 Jun 1861 Medora, Carr, Jackson County, Indiana, U.S.A.
Died 1 Oct 1928 Methodist Hospital, Indianapolis, Marion County, Indiana, U.S.A.
1928: Daughter Savilla Thomas (Mrs. Herman W. Goff, 4815 Guilford Ave, Indianapolis IN) provided the information to the pension authorities, as did the Postmaster of Indianapolis on 16 Nov 1928. U.S. Census Ward 2, Franklin, Johnson County, IN 1870: "Addie Devenport [sic], age 9 b. Abt. 1861 Indiana" in household of "George Burnett, age 27 b. Abt. 1843 Indiana, plasterer, wife Fannie, age 23 b. Abt. 1847 Kentucky; also in the household: Catherine D. Able, age 54 b. Abt. 1816 Kentucky [widow of Joseph S. Able, b. Abt. 1807 Kentucky, of Franklin, Johnson County, IN.]" Evidently, following the death of Margaret Davenport, the younger Davenport children were reared by their relatives, Abel family members. 15 Jan 1908 Indiana State Digital Archives, Marion County Superior Court Records: "Addie Thomas, Defendant, Henrietta W. Norris v. George Kessler, et al, civil case." 13 Oct 1909 Indianapolis IN Star, p. 4: "Realty Transfers. . . . Addie Thomas [sold] to Mamie K. Culmann, Lot 36, Shelby's first subdivisisn, 35 x 132 feet, vacant, east side Dye Street, north of Twenty-seventh Street. $150." 20 Aug 1912 Indianapolis IN Star, p. 10: "Mamie K. Culmann [sold] to Thomas Etta, lot 36, Shelby's first subdivision, 35 x 132 feet, vacant, east side Dye Streeet, north of Twenty-seventh Street . . . $250.00"
15 Aug 1912 Indianapolis IN Star, p. 7: "Arrange Benefit at Roof Garden. [photo & caption] Left to right, seated--Mrs. Addie Thomas, President, . . . Auxillary Frank S. Clark Camp, United Spanish War Veterans"
In 1899 the first camp of Spanish War Veterans was organized in Indianapolis. It was named after Gen. John S. Poland, and Capt. William B. English was the first camp commander. Its membership was made up largely of members of the One Hundred and Eighth Indiana Volunteer Infantry and the officers and men of other organizations making this their home after the close of the Spanish-American war. In a short time the Frank S. Clark Camp was organized as a foreign service camp; the Burton S. Cottrell Camp, primarily as a company organization of Company H, One Hundred and Fifty-Eighth Infantry, Indiana Volunteers; the Capt. William E. English Camp of colored soldiers, made up almost entirely of the Indiana battalion of colored men which was organized in July, 1898, and the McGee-Henderson Camp, composed exclusively of the members of the Twenty-seventh Indiana Battery, known as Battery A, Indiana national guard. 3 Jan 1915 Indianapolis IN Star, p. 8: ". . . Addie Thomas, Installing Conductor, Joseph R. Gordon Women's Relief Corps, No. 43 . . ."
"The National Woman's Relief Corps, Auxiliary to the Grand Army of the Republic, Inc., is a patriotic organization whose express purpose is to perpetuate the memory of the Grand Army of the Republic, as we are their auxiliary organized at their request on July 25 and 26, 1883 in Denver, Colorado . . ."
Much information about Addie Davenport and Robert Thomas family appears in the application file for Robert Thomas's Civil War Pension, which Addie continued to draw after Robert's death. 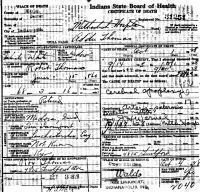 These folks did not keep written records before 1865, so the application file contains many sworn statements of relatives regarding their recollection of births, marriages, deaths, and other events. One of the most interesting of these statements relates to the death and burial of Sadie Wilkins ID 1462254, first wife of Robert Thomas. A relative swore that he was present when the deceased was buried--twice. He stated that grave robbers dug up her grave by mistake, and left the coffin above ground. He helped bury Sadie a second time, so he had first-hand knowledge of her death. Born - 15 Jun 1861 - Medora, Carr, Jackson County, Indiana, U.S.A.
Died - 1 Oct 1928 - Methodist Hospital, Indianapolis, Marion County, Indiana, U.S.A. 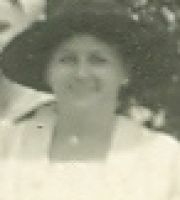 This image was part of a group snapshot taken summer 1919, vicinity of Indianapolis, IN, after discharge of her sons from the U.S. Army (Robert R.) and Navy (Roy Elmer). This scrap of paper was written by a person, (probably Addie Davenport for use in a Civil War pension application for her husband, Robert Thomas), who copied with difficulty information from a gravestone. However, the gravestone has the given name "Sarah E." not "Sadie." The writer had difficulty with syntax, capitalization, and spelling and had attended country schools in Indiana perhaps three or four years. This brief note was saved by Roy Elmer Thomas because he thought it was the "only knowledge he had of his father's first wife," whom he had heard called "Sadie" Wilkins. The inscription on the gravestone indicates she was born in 1862, but for the Census of 1900, Addie gave her birthdate as Jun 1861. "Sanford Thomas, age 26 b. Abt. 1894 Indiana, chauffer--ice cream co. and Robert R. Thomas, age 18 b. Abt. 1902 Indiana, repairman-automobile," in the household of their mother, "Addie Thomas, age 59 b. Abt. 1861 Indiana, father b. England mother b. Kentucky, widow no occupation, renter." Two lodgers also in the household: "Harris Facemire, age 32 salesman-drug store & Bernard F. Walton, age 34 post office clerk." All in household could "read/write."